October 29. Day 29 of My Month of Hundreds. Today would be my Dad’s 88th birthday. He was a year younger than Gina, although no one knew this because she lied about her age ever since I can remember. 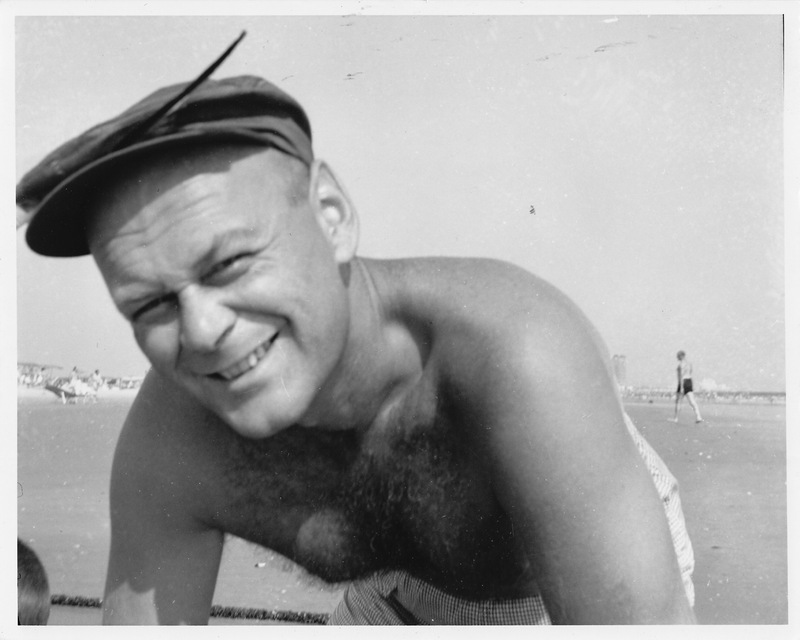 My dad, Sidney Ginsberg, grew up in an extended Jewish family in Philadelphia and New York, had a thick Brooklyn accent, and loved to eat sardines and herring. In many ways he was an odd match for my cultured European mother. He served in the Army, then went to law school on the GI bill. But he didn’t work as a lawyer till later. For most of my childhood he worked in the family business, a garage and gas station in Hoboken, New Jersey. Hoboken in those days was very different from the chic community it is today; it was grungy and kind of scary. The garage got burglarized a few times; an alarm would go off and then our phone would ring in the middle of the night, sending my dad hurrying out into the dark. He worked six days a week and always had grease under his fingernails. A series of de-greasing products made their way through our bathroom, each one promising (and failing) to remove the telltale signs of the working life. On Saturdays, my dad would often take me with him to the gas station. The guys would open the soda machine for me and let me take whatever I wanted. When I was old enough I got to help wash cars and pump gas. Sometimes I got a 25¢ tip. Nothing I have ever done since was more fun; I adored my dad and it seemed like everyone else did, too. He was playful, warm and quick with a joke. I did lots of “boy stuff” with my dad. I loved spending time with him at his workbench in the basement. I can’t remember anything that he ever built or even fixed, but he carried an aura of being a capable and handy guy and I wanted to be like that. He chopped wood in the backyard for our fireplace, pushed me around in the wheelbarrow and taught me how to use the axe. 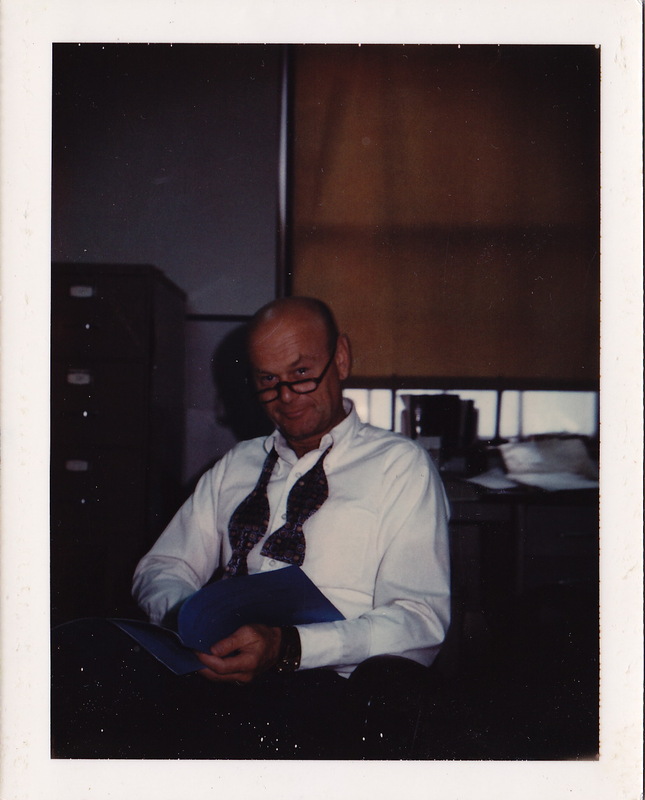 Sometime in the late 1960s my dad went back to school and started working as an attorney for Legal Aid. He spoke fondly of his clients and considered them “underdogs” worth fighting for. At some point a grateful client started sending him a lottery ticket every week. He never found out who the client was but one time he got a winning ticket worth $50. At his office and in the courtroom everyone referred to my father as “Tex”, because he was always wearing a cowboy hat. He shaved his head and only wore bow ties, which I found embarrassing at the time. Every year for his birthday I would get him a straight tie which he would wear once and then relegate to the back of his closet. As I got older I assumed the duty of his weekly “haircuts”, which consisted of using a clipper on the closest setting and shaving off what little hair he had. Sometimes I would leave a patch on the back in the shape of a triangle or square, especially if he had a PTA meeting to go to. I thought this was hilarious and he never got mad. On November 15, 1974, my dad said he wasn’t feeling well, laid down on the floor, and died. I was 17 and a senior in high school. My mother was in shock, and quickly overwhelmed by the business aspects of managing the aftermath. She retreated deeply into her scarcity mentality. The family home became a sad and sorry place. As soon as I could, I got out on my own. My dad would love this project. I think he pretty much would love everything about it. I wanted to honor him today with my gift, so I headed over to our local gas station. There’s a really sweet kid there who has pumped my gas before (in Oregon you don’t get to pump your own gas). I was hoping he might be there today. 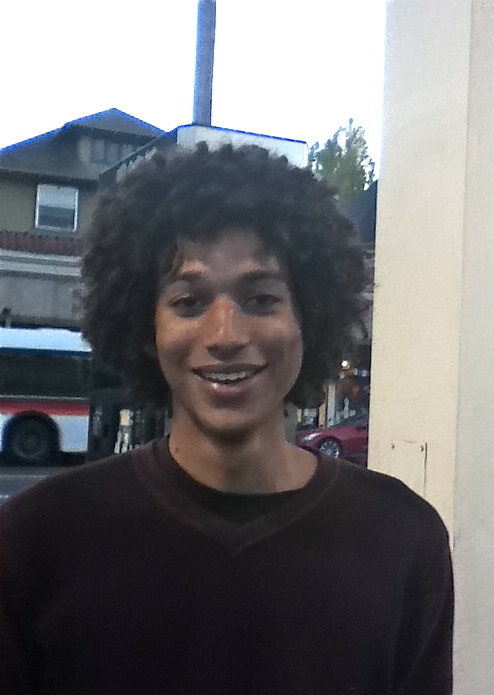 Sure enough, as I pulled in I saw the mop of this young guy’s hair. He started filling my tank and was just finishing up with a couple of other cars. Pretty soon it was just the two of us. I got out of the car. I asked him how he was doing and he said he was good and what about me. I made a comment about how nice he always is and he smiled. “Have you always been like that?” I asked him. “Yeah,” he said. “Ever since my mother raised me. And my dad.” He’s 18 now. I said they must be proud of him and he said yeah, he thought so. He was so happy and excited. I told him he might not realize how much of a difference he makes to people by being his sweet self. He said his name was Julian and asked me mine. “You’re pretty nice, too,” he said. “You just made my day!” Then he asked if he could give me a hug and wrapped his long arms around me. A car pulled in and he loped off to take care of business. He turned back and said, “Whenever I see you, I’m gonna say ‘Thank you, Jill! '” He waved at me, smiling, as I pulled out of the lot. Yeah, I think Sidney “Tex” Ginsberg would have liked this a lot. Happy birthday, Dad. What sweet stories, about your Dad and Julian, too. A perfect remembrance. Now Jill. I live in your neighborhood and I get gas at a station close by. How come EYE never saw Julian? What station do you go to? Your dad has a wonderful face! I agree–he would love this adventure you’ve been on! Too bad he didn’t get to see your life unfold…I think he would have been very proud! I don’t know HOW you’re going to top this one! I had a small fender-bender today which ruined my day… no damage to my car, but I backed into someone accidentally. At my age, I don’t need to have my insurance go up! This story took the sting out of my “owie”, and I agree with others, I really loved your dad’s look, the closeness you shared, the love and nurturing he gave you, that reveals itself in what you are now doing. We are a mix of what Life brings us, the hurt and the healing, and I would say that you are healing VERY well, and will continue to do so, no doubt. You are well on your way to becoming the great person the Universe, and your dear Dad, meant you to be, dear JIll, and on his birthday I wish you EVERY blessing and happiness. I hold you in my heart and thoughts, Jill, and echo you in saying, “Happy 88th Birthday, Jill’s Dad!” I can sleep well, after this! p.s. Julian is BEAUTIFUL… probably inside AND out. What a really immense difference you just made in this young man’s life… I have no doubt it will follow him forever! This REALLY made my day, accidents or no! Wow, you sure triggered a flood of tears and a lot of joy in this one. You could have been talking about mine. He always had a twinkle in his eye and a story or joke to share. He even looked like your dad! He too had perpetual black under his fingernails. Never saw them clean until he retired. He was 93 when he passed two years ago. Over the years life had bunged him up so badly and was in so much pain, he was ready to go. I had not cried until now, and now I cannot stop. Good tears. It must have been that ‘can do’ generation. He was always for making life interesting and fun~ all of the time. I never saw him down, or heard him talk negatively. He even made up stories to tell when he milked the cows. All children should be so fortunate. He was dearly in love with life, and his family. I cannot imagine what life would have been with out him. People feel they were fortunate to have known him. Julian sounds as if he is on the same track of being that kind of person. The world needs more humans such as he. Thank you so much for writing about your dad. Dear Jill, I have been reading all of your blogs as you take this amazing journey of faith. I didn’t get to know you very well in high school however, it’s ironic how much we now have in common. Besides our names, childhood town and school, there is our fathers….my Dad also had that same grime under his finger nails from owning a service station in Rochelle Park near Paramus. There was always a can of GOOP on our kitchen sink which came out when he walked in the door at night…scrubbing way the grime of the day. I have an amazing respect for what you are doing this month, how are you going to stop? It’s like those c-notes are your path to peacefulness. A beautiful poignant tribute to your dad. My dad died when I was 12, I was in 7th grade – life went on, but of course so differently then it should have! You’ve made such a point of including both parents in your journey – how proud your dad would be to see the humanitarian you are! PS – only 2 states who pump gas for customers: NJ AND OR! Happy birthday, Dad! This was a nice foray into a post-October possibility, telling your dedicated readers about your other family members, with a remembrance of your earlier life. Or even just the kindnesses you see around you every day. I wrote a blog post almost every day for close to a year and got burned out looking for “blog fodder” and now post 3-4 times a week and sometimes less. You could write whenever your muse hits, or even daily, but please do let me know more about you and your life, beautiful Jill. How fortunate that Tex and Gina found each other and created a sort of family balance. Tex’s hopefulness balanced Gina’s fearfulness; his outward friendliness balanced her inward protectionism; his inclination toward giving kept in check her inclination toward keeping. Your month of hundreds is, in a kind of cosmic way, recreating that balance, using what she left (made possible because of her insecurities) in a way that pays homage to Tex’s need for external connections. How cool that you became the fulcrum at the center of the seesaw! Jill, I love this one. Made me just sit a moment a think. About dads and daughters, about kindness, about how messy-haired kids can make your day if you let them. Thanks, once again, for a little taste of something beautiful to start off my day. I have often fantasized about having the extra cash to secretly pay someones heating bill, or seeing that they get a gift card to a grocery store….etc. How I envy you lucky ones who had a father like Jill’s! Even though they died young, you had their attention and love enough to treasure and remember it. I grew up in the Great Depression in a very violent Sicilian immigrant family. My mother was a battered wife; my two brothers and I were battered kids. It was a simply a nightmare. No one dealt with it well, and yet my mother was a fierce survivor. My brothers, sadly, were in denial all their lives. would not be forgotten, and gave my dad permission to leave this world, frightened as he was. It was a privilege and a blessing for me to be present at that so important moment. Exalting, unforgettable. It brought me peace. I like the attorney at law pic, he’s very elegant 🙂 And Julian has such a sweet happy face. I love that you reminded him just being a nice person can make all the difference in someone’s day. Love to you!! Jill….I am writing to you because Julian is actually my daughter’s boyfriend and consequently, I have gotten to know him very well…what you picked up on about him is completely spot on….he is a very kind soul….but were you aware that he is a very talented artist and poet?…a classic example of a person with many layers….no, he doesn’t have Life figured out yet…but he is the love of my daughter’s young life and she, his…and experiencing their Young Love from a front row seat has been nothing less than awe-inspiring….initially, when he told me about your generous gift, I admit I was skeptical of your motives….I mean, WHO DOES SOMETHING LIKE THIS? lol…but I see now that not only were your intentions pure, but that you are affecting change in others by affecting change in yourself…this is the QUINTESSENTIAL Pay It Forward story….I am deeply moved….and those of us who know and love Julian are as well….thank you for what you did for this sweet kid and everyone else on your journey…you know, our world can seem awfully big and incapable of change until you realize it’s really just right outside your front door, like the kid that pumps your gas…and with Baby Steps, anything at all is possible! As a wise man once said, “If you want to make the world a better place, take a look at yourself and make that change”…thanks for making that change in your life and those you touch, Jill!